To go with our amazing Serenity Model from earlier in the week. 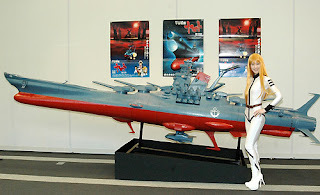 ANN has posted news about a giant 5 meter long model of the Space Battleship Yamato being displayed in the Aeon Group's department stores. The purpose of the model is to drum up publicity for the upcoming live action adaptation of the show slated to come out early next year. Unfortunately this model isn't for sale.